Microsoft Office allows for geographically dispersed groups to send invitations to meetings and appointments scheduled in Outlook. If these groups are in different timezones which may or may not following the new DST times, meetings or appointments may end up being scheduled incorrectly. Microsoft has released a utility to check your appointments and update their time accordingly. 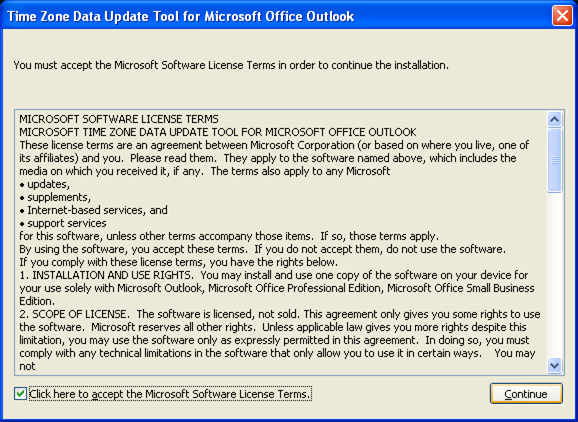 2.Check "Click Here to Accept the Microsoft Software License Terms.". Then select "Continue". 3. 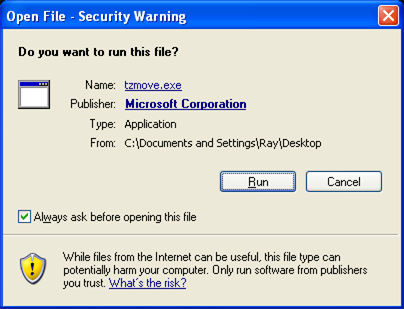 A Dialog box will apear asking you which data file you would like to update. Thei data file is your Office PST file. If you have multiple PST files you may have to run the application more than once selecting a different .pst each time. For most users leaving the Personal Folders will update your default calendar. Ensure the "Original Time Zone" is correct. 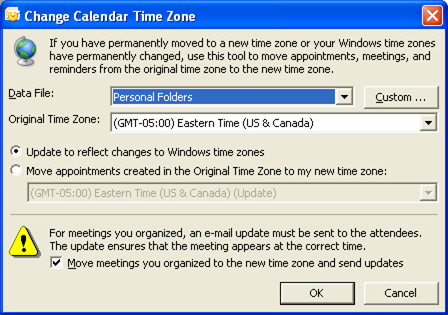 Leave the radio button "Update to reflect changes to Windows time zones" is selected. As well you may want to check the "move meetings you organized" check box to automatically notify others of meetings you organized. Once done hit "OK"
4. The tool will now go through your Outlook calendar and update all meetings and appointments. It will give a status box once finished. If you have any difficulty in patching your systems please send a support request to support@biomed.queensu.ca or call x714139.